Purpose. 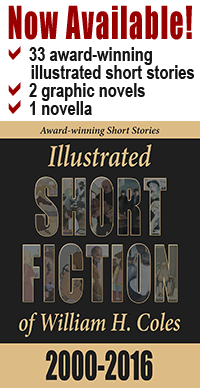 To provide writers of literary fiction stories with instruction and critiques to improve writing and storytelling skills. Memoir and creative nonfiction are not a part of the curriculum. What to expect. You can work at your own pace. 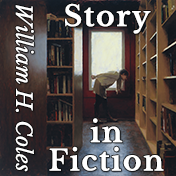 There are assignments designed to introduce you to common problems in writing literary fiction–and to stimulate you to create scenes and stories. 1. Complete an assignment. 2. Submit your work for comment. Comments will suggest ways to be more effective, without subjective value judgments on writing quality. There is an emphasis on storytelling–how to create dramatic meaningful and entertaining literary stories. Reference reading will be suggested as well as other assignment and exercises. 3. You can resubmit revisions for comment as often as you would like. Comments. 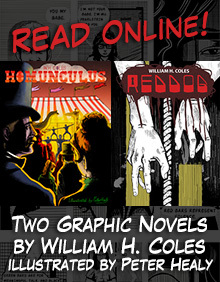 All comments are by William H. Coles, award-wining author of novels and short stories, extensive experience in more than eighty academic workshops, and educator with thirty-five years experience as professor in post graduate school, and international lecturer on literature, Georgian antiques, jazz, and surgery. You are not required to critique other student’s work, and other students will not critique your work. Cost. The workshop is FREE. 1) Assignments are posted periodically. (You can receive email alerts by RSS subscription, available on each page.) References are given. Rationale for completing the assignment presented. When appropriate, examples are given. 2) To participate, Submit your solution to the assignment. 4) Responses and critiques are saved with the assignments for future reference and study. Access is free and open to all. You are welcome to resubmit your work after revision too. There are two ways to submit: 1) work off line and paste the completed work in the box (note that you will not be able to access it for revision after you submit), 2) work online in the box, (but,remember, you will have to submit when you finish working on line or your work will be lost, and once submitted you will not be able to edit. 5) There is a word limitation that is different for each assignment. Only text with words under the word limit is accepted. This essay will give you what you need as background to approach the assignment. Assignment instructions follow. As a fiction writer, an author orients the reader as to where and when the action takes place by creating a setting. Well-constructed purposeful settings also evoke image stimulation, establish mood, and can supplement characters’ motivations and feelings in the moment. Without doubt, creating great stories depends on author skill in establishing settings that are integral to story development and understanding. In essence, with the start of every new scene (if not carried over from previous scenes), the author establishes where, when, who, what. Even in techniques such as stream of consciousness, or back-story reflection, readers need orientation. In this assignment you will learn important principles in effective story design that makes story memorable and significant and therefore enjoyable. How beginning, middle, and end principle brings momentum and energy to story. How, for literary stories, character-based storytelling with dramatic plot changes are at least partially caused by character thoughts and action, and careful consideration of plot progression. The assignment is for practice creating scenes for stories. A story in a series of interrelated scenes with beginning, middle, and some resolution that allows movement to the next scene. Scenes are built with dialogue, narrative description, careful attention to perspective, imagery, momentum, structure, and story purpose. These exercises are like learning scales before trying to play music. Dramatic fiction scenes have action. When in-scene writing is the most effective for the story moment, dialogue and action are often used together. Probably the most common action situations for writers for characters in a scene are eating, traveling as in a car or bus, or just meeting somewhere, situations which tend to be listless to inert. Yet, to keep the reader oriented as to what’s happening, and to augment the dialogue, the action in the scene has to be presented so the reader’s imagination is holding onto the scene visually and recording progressive–be it minimal or robust– action, and experience the imagery and action in fresh, unique, and significant ways, to support the meaning and story. Because in scenes where the dialogue is prominent and busy providing conflict, characterization, theme enhancement, etc., the supportative setting and the movement in the scene must be well written to contribute to a great story. The task is variable from story to story, and success requires practice. 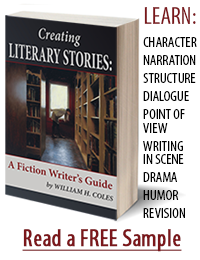 Create in-scene dialogue that reveals characterization and advances the plot. Three characters, equally involved and important in the scene. If you, as a writer, don’t find the challenge of this assignment exciting, you will probably never create great fiction as an art form. The goal is to build great characters through in scene action. If you succeed, after practicing and evaluating, your storytelling will take on new dimensions that will fascinate your readers, stimulate their memory, and stimulate their admiration for you with your ability to give them pleasure through a fictional story. That has a good chance to give you great pleasure you will probably never experience in any other way. Practice writing a scene in the voice and worldview of a character in a scene provided. This is a dual exercise: create scenes in two different settings, one static, the other active. A setting can be a source action of a scene, or the action can be set in a static scene where conflict is in dialogue, or thought, or metaphysical, and may contribute with contrasts suggested by the setting itself: irony, metaphor, back story, and exposition, to name only a few (example–a character contemplating suicide–the reader is influenced by the content and quality of the setting, which represents great potential for the good writer). This assignment challenges you to make up a story. About people. Make it credible with no requirement for suspension of disbelief. Some change must occur in one or more of the characters, either in thinking or feeling. This is a famous photograph from the cover of life magazine. Create three scenes, each no longer than 500 words. The quality of sentences in fiction are crucial for conveying meaning, shaping character, providing momentum for the story, establishing voice not in dialogue, stimulating images, transferring ideas, providing rhythmic structure for reading ease and pleasure. Purpose: to create a literary story (character-based) with six scenes, each scene limited to 250-words, a story that embodies beginning/middle/end, dramatic elements, and develops characterization through action, that is showing rather than telling. Purpose: exploring genre and literary fiction; writing purposeful dialogue; learning to think and create characters.